After facing Smith-Cotton High School in the district championship game Oct. 26, the soccer team emerged as back-to-back district champions after securing a 2-2 (4-1) victory through entering penalty kicks. Going into the crucial game, the Bruins already had an advantage over the district foe. In their Oct. 6 regular season matchup, RBHS sent the Tigers home after capturing a 3-2 victory. “I don’t think there was any nervousness going into the game because we liked how we matched up against them in the regular season and thought we controlled that game,” junior midfielder Johnny Klein said. Four minutes into last night’s game, Smith-Cotton scored the first goal, putting them up at a 1-0 advantage. The lead would eventually be tied when senior forward Brandon Rettke responded with a goal of his own in the eighteenth minute. Later in the first half, Klein was awarded with a penalty kick — a chance for the Bruins to take the lead. 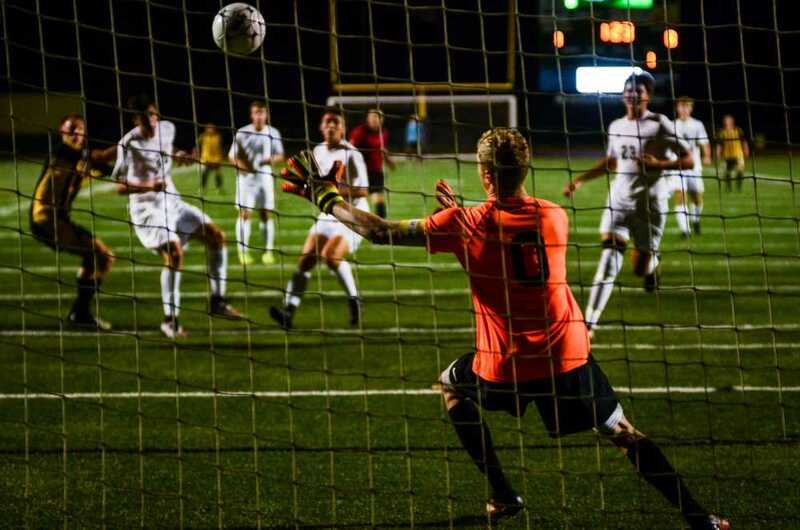 Although the ball initially flew right into the hands of the Tigers’ goalkeeper, it would not matter, as Klein immediately sent the ball right into the back of the net after getting hold of the rebound. In the second half, Smith-Cotton drilled in a penalty kick of their own, tying up the score yet again. “[Johnny’s goal] went into the back of the net, and that’s all we needed,” Abram said. Afterwards, the scoreboard would remain unchanged throughout the rest of the regulation period. After two hard-fought overtime periods, the game was still tied 2-2; both teams had stood their ground, yet neither could gain any advantage on the other. Ultimately, the game entered penalty kicks to decide the victor. The Bruins hammered in all four penalty kicks from senior midfielder Drew Stanowski, senior forward Brandon Rettke, Klein and Abram. Smith-Cotton, on the other hand, only managed to send one into the back of the net. Again, RBHS’s efforts granted them a back-to-back district championship. Now, the Bruins are looking to take their postseason campaign one step further in the beginning of sectionals against Lee’s Summit West (LSW) on Tuesday, Nov. 1. Klein and the rest of the Bruins are confident, but know the competition they will be facing. How do you think the sectionals match-up will play out? Let us know in the comments below. I probably should have kept up on sports throughout the fall season but congrats to them! I love being at a school with exceptional talent in so many activities.